Photo by Neon Tommy, via Flickr creative commons. 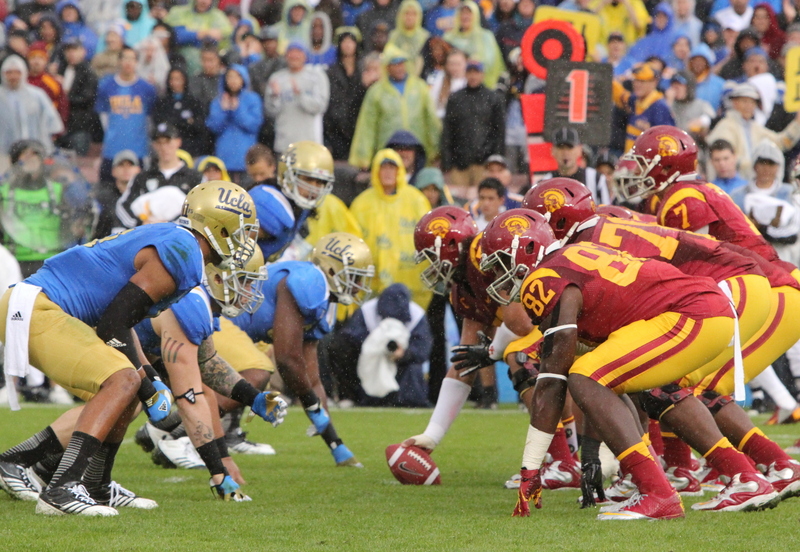 Save your game face for the game — not traffic — by going Metro to the 84th football showdown between crosstown rivals USC and UCLA at the Rose Bowl this Saturday, November 22. Kick-off is scheduled for 5 p.m.
To get to the Rose Bowl using Metro, exit the Gold Line at the Memorial Park Station and walk four blocks west on Holly Street to catch a free shuttle to the Rose Bowl that departs from the Parsons Corporation parking lot at Raymond Avenue. Alternatively, it’s about a 20- to 30-minute walk from Memorial Park Station to the Rose Bowl. For fans coming from the south and east, the Blue and Expo Lines connect to the Red and Purple Lines at 7th Street/Metro Center. Take the Red/Purple Line to Union Station, where fans can transfer to the the Gold Line for the 20-minute ride to Memorial Park Station. From Westwood Village, Metro Rapid 720 and Metro Local 20 buses connect to the Purple Line at Wilshire/Western for a short ride to Union Station and the Gold Line. For park-and-riders, Union Station offers $6 dollar parking in the underground structure at Patsaouras Plaza (enter off Vignes Street). Other Gold Line stations have parking, both free and paid. Make sure to load round-trip fares on your TAP card in advance to avoid long post-game lines. Round-trip fare costs $3.50 or a Metro Day Pass costs $7 dollars. And if you’re hoping to stay out late celebrating your team’s claim to the Victory Bell in Old Town Pasadena or elsewhere, Metro trains run until 2 a.m. TAP cards can be purchased for $1 at TAP vending machines at all Metro Rail and Orange Line stations, in addition to El Monte Station.